If you have run the software for the trial period and wish to continue using the software for your company, please visit the website at: http://www.hexamail.com/pricing.html There you can purchase a permanent license for the number of users you will have using the system. If you are unsure as to which features of the full version you require, please visit: http://www.hexamail.com/hexamailguard/features.htm for a full description of each feature. 1)Run the Hexamail Guard Administration application by choosing Hexamail GuardAdministration from the start menu. 3)Browse for the license file you saved from the email attachment (the file with extension licml) you received when you got your download instructions or confirmation of purchase. Once you have saved the license file in a convenient location - you can use the administration interface to browse for it and put it in the correct place for you. Open the administration interface, select the Admin sheet, go to the License page within the Admin sheet. 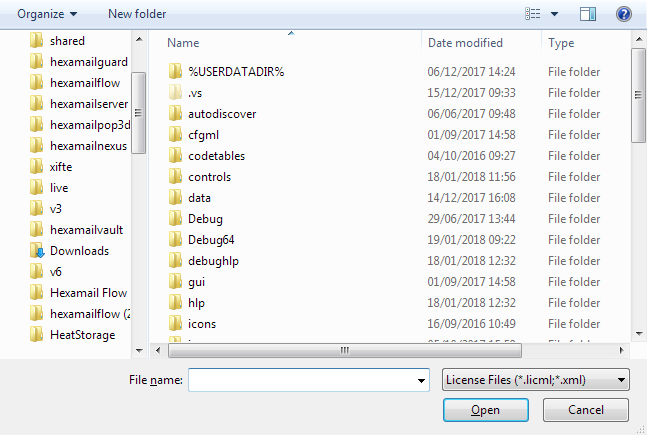 Click the Browse button and find your License file (licml). The administration interface will then copy the license file to the correct location. 4)Restart the Hexamail Guard service using the Windows Service Control Panel or by opening the Hexamail Guard administration interface. The administration interface will ask you if you wish to start the service in a paused mode ready for configuration.